Additional Notes: #Charles-Camille Saint-Saëns was born in #Paris on October 9, 1835, and died in #Algiers on December 16, 1921. He composed the Introduction and Rondo capriccioso for violin and orchestra in 1863. #Pablo de #Sarasate, for whom the work was written, was the first to perform it, in 1870. 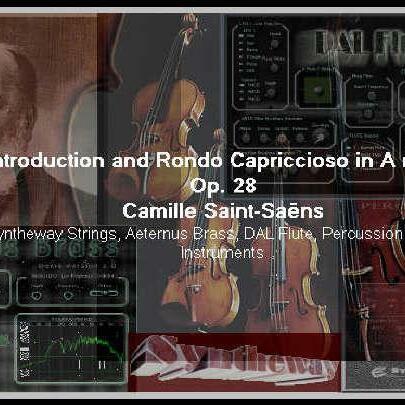 The Introduction and Rondo capriccioso was conceived as an independent piece, and it has been consistently popular. 1.- Syntheway Strings VSTi: Is a rich-sounding #sample #based string #VST #instrument. Its Multisampled Ensemble Strings: Violin, #Viola, #Cello & #Double #Bass, has the ability to produce beautiful and lyrical lines, as well as powerful and forceful articulations. 2.- DAL Flute VSTi: Is a virtual woodwind instrument combining multi-samples of real flutes with a Digital Signal Processing (DSP) engine. Offers control over several parameters allowing you to sculpt new and interesting sounds. 3.- Aeternus Brass VSTi: Is a Virtual Brass instrument, featuring solo #Trumpet, #Cornet, #Trombone, #Tuba, #FrenchHorn, #Flugelhorn as well as #Brass #Sections and Orchestral Ensemble. 4.- Syntheway Percussion Kit VSTi: Is a collection of percussion instruments designed for creating Orchestral Percussion, #Auxiliary Percussion, #Mallet Percussion, #Latin Percussion and #African Percussion. 500 MHz Processor ( #Pentium, #Celeron #AMD or equivalent) minimum. Windows Operating System : Windows #XP, Windows #Vista, #Windows7, #Windows8 / x86 (32 bit). For Windows x64 (64 bit) test it first with #VSTBridge, #jBridge or #BitBridge.